In Garland Village there is a blue door that opens into a black box of fun! With wit, wisdom and wonderful comedy, The Blue Door Theatre focuses on the art of improvised story telling. The "black box theatre" in which they perform is simply that. A simple unadorned black space that draws its hilarious entertainment quality from the performers who parade through it! The Blue Door Theatre is a non-profit 501(c)3 organization dedicated to the advancement of improvisation and the performing arts through innovative entertainment and education. What this really means is that there is allot to laugh about here! The troupe of 20 specialize in long-form improvisation which starts with a single suggestion from the audience. The improvisers explore that suggestion through a series of connecting scenes, games, songs, and monologues. The outcome is a piece that has realism and comedy and takes the audience on a roller coaster ride of emotions and laughter until they find themselves cleverly back at the beginning. 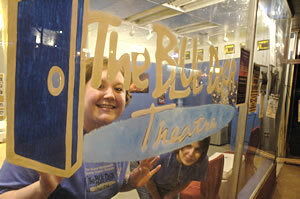 Since its creation, the Blue Door Theatre has been an all-volunteer organization and just wrapped up its 10-year anniversary season! The seasoned troupe also offers witty classes for both adults and children to learn the fine art of improv. Looking for a rent-able group of funny people? The Blue Door can bring their improv insights to your corporate event, college function, school assembly or private party to create a laughable time! Need a humorous moment? Walk in the Blue Door for a completely original, improvised and funny show. What wit! Shows that are clean, professional, and always funny ! All Seats $7. NO special offers, coupons or group discounts. Safari is an improv showcase featuring short-form, long-form and anything in-between! Some material may not be suitable for all ages (rated PG-13). Youth and Teen Saturday morning Improv classes 5 times a year for ages 8-17. Adult Improv Classes 2-3 times a year.